Adult: approximately crow size; sexes similar in coloration patterns; Tail: short, broad with usually 3 black and 3 white alternating bands; Throat: light with brown streaking; Wings: underside light brown with brown or black barring on primaries and a distinct wide black band along trailing edge of secondaries; Eye: cinnamon to brown. Immature: similar to adult; Throat: white; Underside: white with dark vertical barring or streaking; Tail: 8 indistinct bands; Eye: gray to brown. Generally found nesting in northern hardwood, deciduous or mixed coniferous forest. Nests: small 10-18" in diameter in deciduous trees. 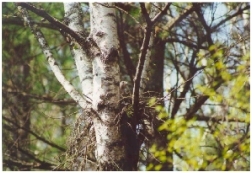 Commonly nests near forest trail edges. Typically observed perched on the edge of forest roads and trails. 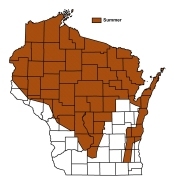 Summer resident common in the northern 1/2 of state; present in forested areas in southern 1/2. Not present during winter.